The Apple TV we bought for the church arrived today. The device is small. The remote a little larger than I expected. Box has remote, power cord and the Apple TV. Hook up was simple. Set up was also easy, if a bit tedious. The initial text entry is not as easy as the rest of the set up. Long strings of text navigated by the included remote don’t make for swift text entry. Compared to the rest of the set up, it was a bit laborious, especially when my co worker forgot his Apple ID and had to re-enter it. But if that’s my biggest gripe, then there’s nothing to worry about. I’ve read that the new version of the Remote app for your iPhone or iPad works better. After set up it was on to playing around. The TV we were using did not treat SD content very nicely. But when we went to see the trailers provided by Apple, we were impressed. it really looked great. To see your files on your iTunes, make sure you have version 10.x, and turn on Home Sharing. Files streamed quickly. The computer were using did not have any of my own videos on it, so I can’t compare quality. We hooked up a Netflix account. I was very very happy with how this worked. loved the display and the quickness of the buffer. I’m guessing that 8GB of flash memory helps. We could skip around in the video without long pauses for buffering. My home Blu Ray player always has a long pause to catch up if you try to fast forward. I am eager to get my hands on my own and try it out at home. Here, we are looking at ways to jailbreak it and lock down content so we can use it for in class streaming around campus. There are a lot of ways you can you can compare and contrast these two fast food restaurants, but I noticed something the other day with regard to how each handles the lunch rush. We went for a lunch at McDonald’s. Like any rush at a McDonald’s there was a line to order and a line waiting for their food. My friends sat down waiting for our food and one commented about how much better a Chic Fila was run. Here was a general lunch rush and McDonald’s couldn’t keep up, while Chic Fila never seemed to have any problems with rushes, though they seemed to be just a busy during the meal times. I thought about it for a second, and realized that it wasn’t that Chic Fila was that much faster than McDonald’s in making food, but the key difference is that Chic Fila will often bring your food out if there is a wait. (Some McDonald’s may as well, but I’ve been to enough to know it’s not common.) Franchises in malls have the same lines of waiting people that other fast food restaurants do, but their stand alone locations almost always have people find a seat, and bring their orders out when things get backed up. The result is not only a feeling of a better run establishment, but a feeling that they care about you. There is no standing idle in earshot of every comment from the kitchen. The time is spent sitting at your table, with your drink, chatting with your friends and family, just like a sit down restaurant. Chic Fila allows me to be comfortable at my table where I can talk with my friends, and makes me feel like they are adding layers of service to a fast food meal simply by having someone staffed to walk the orders out to guests. I get the impression that things are better run, whether they are or not. I have a more pleasant experience, and am more willing to come back when the restaurant is busy. But if I see a McDonald’s with a long line, I may choose to go somewhere else. This one small thing helps set Chic Fila apart from other fast food restaurants. What are we as ministries doing that gives the impression we don’t work efficiently? What little thing can we do that would make a first time experience better for guests? How can we make people comfortable? Run. Evacuate as quickly as possible. I’d like to say that this is just conjecture or something I’ve read, but this morning we got to find out for sure. 25 years ago, when the building was designed the room that broadcast control occupies now was the server room for IT. When they built it, they installed a halon 1301 fire suppression system. Two and a half decades later, it went off. It was one of those one in a million fluke things. A volunteer put something against the wall, which fell into the pull switch for the alarm. (See picture for just how small of a hole it had to hit) When that happens there is supposed to be at least 10 seconds, if not more like 30, before the halon discharges. Right next to the pull switch is a kill button. If you accidently set off the system, you can hold that button down and prevent the Halon from firing. In this case, I heard someone say, “Oh no!” and then the alarm sounded. I had enough time to look up and start to get up when halon began filling the room. It was maybe 3 seconds, maybe. Nowhere near enough to make it to the button, or even ask someone closer to push it. Near me was our veteran video engineer. He helps keep our ancient gear looking acceptable. He’s worked everywhere, and knows a ton about broadcast gear. So, when his first response was to turn and run toward the door, I knew we were in serious trouble. People poured out of the control room. Luckily we had already met before the service, and most people were out heading toward their posts. Still, we had seven or eight people in the room when the halon fired. I was at the door yelling for everyone to get out, watching a white cloud of halon gas envelope the room. The audio engineers where in the back room, and when I looked at the doorway I saw nothing but white clouds. I later learned that our A1 for the service got a face full of the gas. He was standing up, and the nozzle sprayed right at him. He could not see, and was stumbling out of that room, when he tripped over another volunteer. Both got up and rushed out the door. Meanwhile, we got the other door open for the machine room (which actually doesn’t have a halon system) and got those folks out. The general fire alarm was going off. Once I figured out we had everyone out, I ran to security and told them it was a false alarm, but that the halon system discharged in broadcast, so please let the fire department know. Paramedics came and looked at our A1. The Fire Department came and killed most of the alarms, but they had to wait for HazMat to come before entering broadcast. Meanwhile we had a service to do. We had no access to anything in the video realm. The switcher was on the preservice loop, and the internet was being sent a “We will begin in a moment” graphic. The beginning of the service had a Parent Commitment segment, and I needed to video tape that. We had no screens and no prompter. One of our cameras was out being used to record a class, so we called that back in just in time to capture the Parent Commitment portion. The musicians got sheet music and stands, and led that way. We had audio and lighting, but no video. We went up and turned off all projectors. And the service went on. And God was worshipped. The word was spoken and people responded. There’s no doubt that in a room our size, screens help, but it’s obvious they are not necessary. A bigger question is what will we broadcast next week? 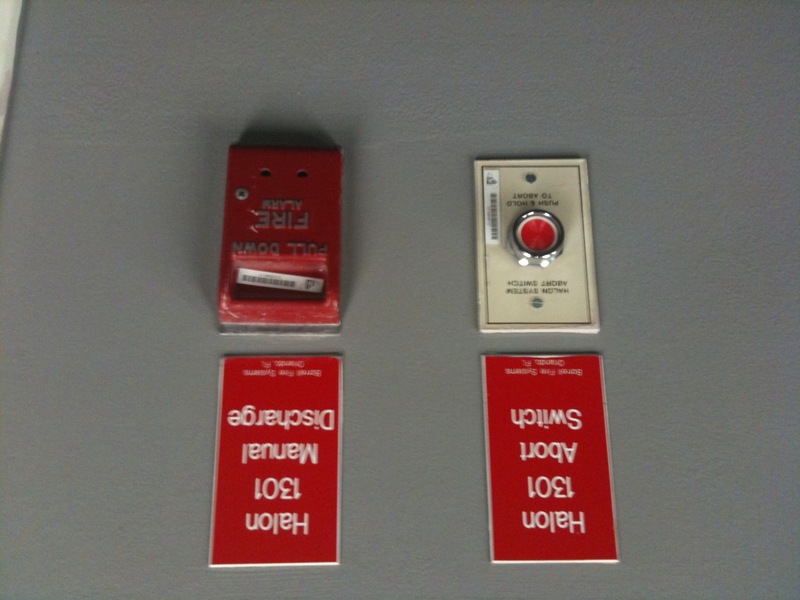 Of course, people stopped using halon systems years ago. Now we get to figure out what to replace it with. I recently got rid of my old iPod Touch 8GB (2nd Gen) and purchased the new iPod Touch 32GB. I’ve only used it a short while, but here is an initial review. It’s fast. Much quicker than the 2nd Gen I had before. iOS 4 runs well, with all features enabled. The 2nd Gen Touches could not do multi tasking and such. I have not used Gamecenter much, but it works great. Going from 8Gb to 32Gb was a big leap, but allows us to store a lot more video and pictures. We use the iPod Touch when we travel to send video to a small flat screen in the car. I know it’s not as good as the iPhone 4, but man, is it good. My 3GS doesn’t hold a candle to this. Everything looks great on it. As expected, it plays back video wonderfully. I can use the videos I ripped using handbrake and the slightly altered Apple TV settings. They look great. Otherwise it is like previous iPod Touches. I have not used this much, but it is very easy and can be very useful. I had a 20 minute conversation with a friend out of state. It’s not like having a face to face conversation, but you can pick up on visual cues on the other end. if you need to show something to someone, or just let other family members see the kids, this is a great feature. It’s simple enough that anyone can use it, and as a result, will likely be more successful than other video chat features on other phones. Using the iPod for this was very easy, my Apple ID email is the address that FaceTime uses instead of a phone number. I have had a couple of times playing around where the other person’s iphone 4 was not able t connect. one error message said the other person needed to upgrade their phone OS to 4.1. The still camera is a huge disappointment. I knew that this would be the case before I ever ordered it, and I did not buy the iPod Touch for the ability to take still pictures. But, to have a 0.7 megapixel camera in today’s marketplace doesn’t make any sense. I would almost rather they not even include the ability to take stills. Photos loaded on the iPod from iPhoto look amazing on the new display. The iPod Touch shoots 720p. It does a good job in different lighting environments, except for low lit areas. It is about on par with other single CMOS chip video cameras with small apertures here. There is no real adjustment, but point and shoot. You can record from the rear camera, or use the front facing camera (at a lower resolution, of course). If you pan swiftly, any vertical lines appear to lean. It’s a known problem. Even the Sony A1U I use has issues with this. The only solution is to not pan quickly when there are vertical lines in the shot. Generally, I am very satisfied with the video capture capability. Microphone is on the back. i am working on ways to get external microphones into the iPod Touch and iPhone. The headphone jack seems to use the same wiring as the iPhone, and should allow for an external microphone input with the right conversion. Overall I am happy with it. The still camera is my biggest gripe, but that was expected. I’ll have more in depth review of the new iPod Touch very soon, but I wanted to talk about how the newest feature of the iOS family works with something that isn’t a phone. It was seamless. Simply launch FaceTime, log into your Apple ID, and make a “call”. I called a friend who had just had a baby a couple weeks ago. I had not talked to him since, and I knew he had just gotten an iPhone 4. So, I texted him to see if he was available. Then launched the app. I found that I liked the landscape mode best. I swapped to the rear camera once. Talking by video is a whole new animal. 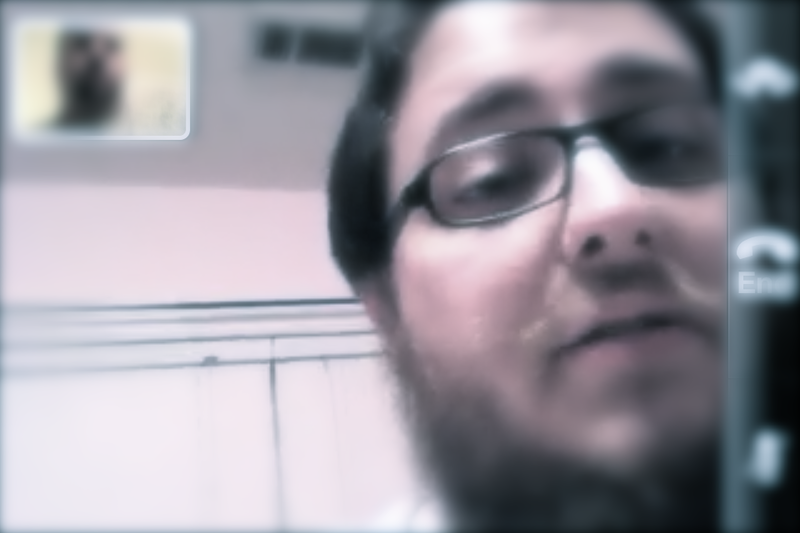 I haven’t used Skype or even iChat before, so this was a pretty new experience for me. It’s definitely not like sitting the same room with someone, but you can send a receive visual cues and interact more than a simple phone call. But you have to hold device where you can be seen. And there’s not a lot of talking while doing something else. 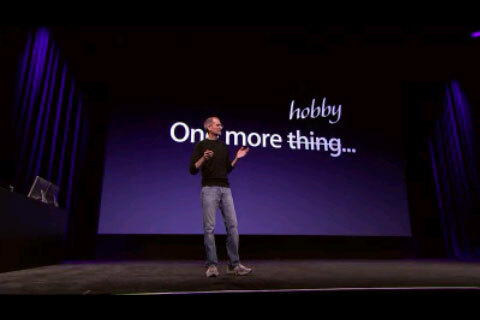 The other day I saw a comment from Intel’s CEO about the Apple TV. Last night I read a NY Times article about how it compares to other media streaming devices. The device isn’t even out yet, and it is already being panned. Sometimes people don’t see the forest because of the trees. 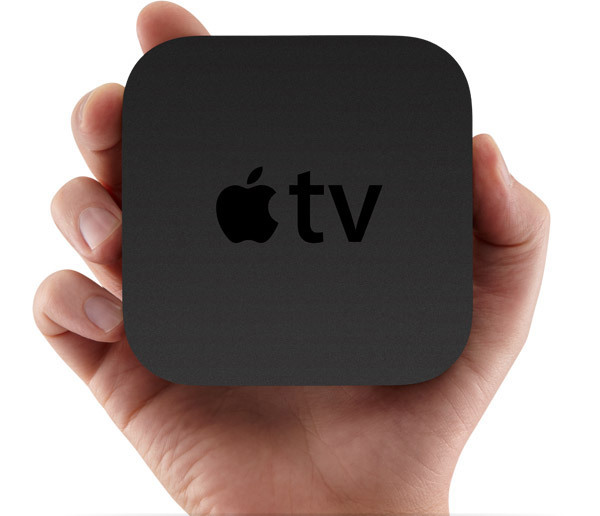 The Apple TV will stream video itself, and probably will see that capability improve as Apple updates the device. But the real genius of the new Apple TV is AirPlay. Until the beta of 4.2 I mostly had conjecture and hope, but seeing this article from 9to5Mac, the “Go to Market” strategy is coming into focus a bit more. The things people are saying about the Apple TV, even Apple’s marketing strategy, focus on what it does that every other streaming box does. And, the Apple TV doesn’t really stand out from that crowd. It’s a media streaming box. But when you couple it with AirPlay, you get a whole other level of interaction and media consumption. The NY Times article completely left out AirPlay, but for me, that is the key strength of the device; easily streaming content from computers and iOS devices to the TV screen. So, in many ways, an iOS device becomes a remote for the Apple TV, where you select content and send it for display it on your TV. This will be done using Apple’s intuitive (I hope) interface. If this is simple enough for normal people to grasp, the Living Room is about to change. Surf on your iPad or iPod, find a video, send it to your TV and enjoy. The more apps that are developed with this capability the more useful it becomes. Apple TV is supposed to ship in September. 4.2 releases in November. Ever since I’ve had access to an iPad, I’ve been on the search for the best note taking app out there. I’ve used several, ranging from free to pay versions. I had some great experiences, and some annoying ones. It came down to the basic note taking app that come standard, Awesome Note, and Evernote. Here’s what I wanted: Ability to sync between multiple devices, multimedia capability, and security. The only one of those three that has any security is Awesome Note. I almost settled on this one. It looks great, can handle images, can sync (sort of) and has the ability to passcode folders and entries. I tried the Lite version for a while and got the “pro” version, ready to move forward. Then I started to run into problems. First, there is no iPad version yet. So the iPhone version on the iPad is syncing to Google Docs, and the one on your iPhone is doing the same. The program cannot handle that. I always had multiple versions of notes. File management was a real problem between multiple devices. I tried to fix this by altering the Google Docs, and re syncing, just to find that I lost all of my folders, and some of my latest notes. If I hadn’t had the files on my other device I would have lost some very important data. All the folders and settings were wiped out. Until Awesome Note comes out with an iPad version and a way to handle multi device sync, I won’t be settling for that app. So I was back to the included note app, with it’s limitations. It synced just fine, but no pics and no security. Then I found Evernote. Free unless you need a lot of data transfer, the app has versions for the desktop, iPad and iPhone. The “cloud” is the master, so changing an entry and syncing means that the next time the other apps open, the latest version downloads. You can do all kinds of media, and there is a huge community surrounding this program. I have the Safari plugin where I can “clip” websites and save them as notes. I can edit on my laptop, phone, or tablet device and never worry about which is up to date. Then there’s the Trunk, with all kinds of free content. The interface isn’t as fun as Awesome Note, but it works. And, if I really want to use the Awesome Note app, I can sync from it to Evernote. And I can use Seesmic to save twitter or facebook content. The one thing it lacks is security. Sometimes I need confidential information, and carrying it around on an open program makes me nervous. I know, it’s no different than writing it on paper, but it feels less secure. The only option is to use the passcode function on your device. Probably something you should do anyway, so that is how I am securing my data. There is still a ton that Evernote does that I have not tried. And it seems that the community wants to make it better and more useful. There are probably a lot of other programs out that that work great, but for now I have settled on Evernote. if Awesome Note updates with an iPad app and fixes the sync issues, I may switch back. But I will still sync with the Evernote servers. Simple is Key: Why Intel Makes Chips and Not Devices. I saw an article that quoted Intel CEO Paul Otellini talking about the new Apple TV (which doesn’t use an Intel chip, by the way) where he said that he thought the device should have been more like Google TV, offering the “full internet” alongside TV. He went on to say Apple’s device will appeal to his “mom” because it’s “simplistic,” while Google’s device will appeal more to those wanting more, like his son. This is why Apple makes devices and Intel makes chips. Otellini is looking at the word through his lens, but the rest of the world wants simple and easy. I am a fairly technical guy, and I hate working on a PC. It’s not easy. If you do anything out of the normal use of basic applicationss, it gets very complicated. And because it’s a PC, you seem to have to do things beside normal application use from time to time. A major draw for Apple is the fact that people can easily use their products. Even the complicated stuff is easy by comparison. Need to rebuild your Mac? Just throw in the OS disc and follow the on screen prompts from erase to reload from Time Machine. 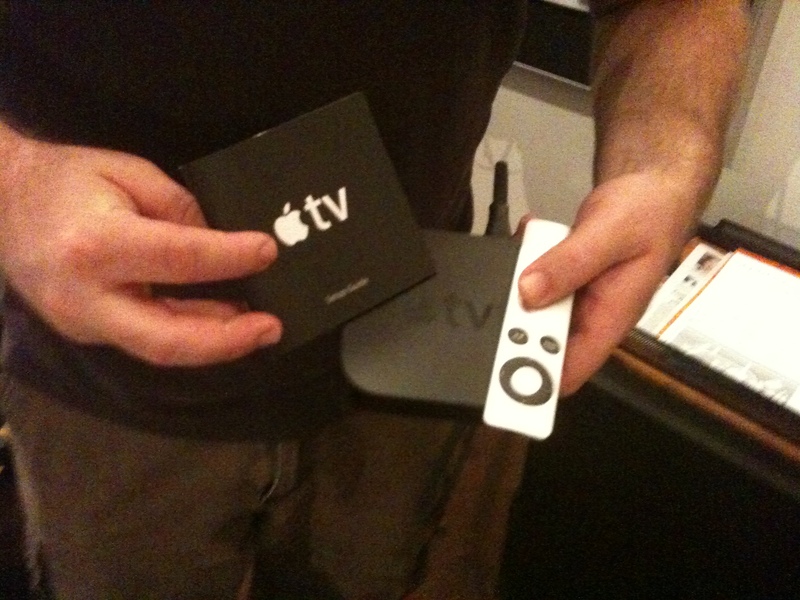 I have not used the new Apple TV, but I have used the old one, and just about every Apple device from the last decade. Apple does easy. Time and time again, products have been introduced just to fail because mainstream people will not adopt them. If it’s not easy, or similar to what they already do, people don’t like it. 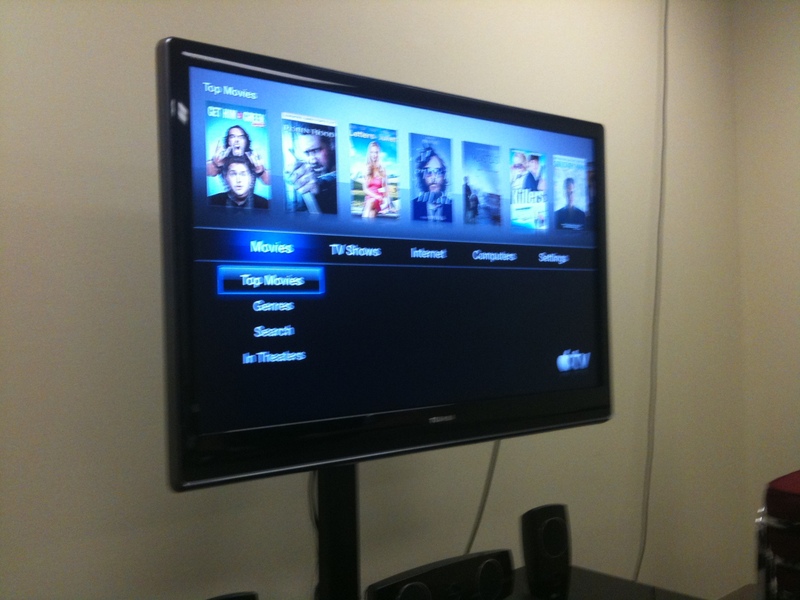 Technical people own media PCs and hack their old Apple TVs and run boxee and such. They canceled their cable bills long ago. Normal people have the cable guy come and set up the box and show them how to run the DVR. They are interested in a more on-demand kind of video service, but not if it is hard to understand. Does the Apple TV do everything it could? No. It doesn’t even do everything it should, yet. But it will be easy enough that normal people will use it. Now it’s up to Apple to keep updating the system. Yesterday I ordered a new 32GB iPod Touch. Which means that my old handbrake settings may now be obsolete. I have always tried to maintain settings that would allow video to be played across all of my iOS devices, iPods/iPhones, iPads and Apple TVs. Previously that meant that I needed to start with the iPod preset in Handbrake, and make adjustments. With this new HD capable iPod, I suspect I can start with the Apple TV preset. I won’t know until I get the iPod Touch, but I have made a couple of test files. These files loaded and played on my iPad and iPhone 3GS. 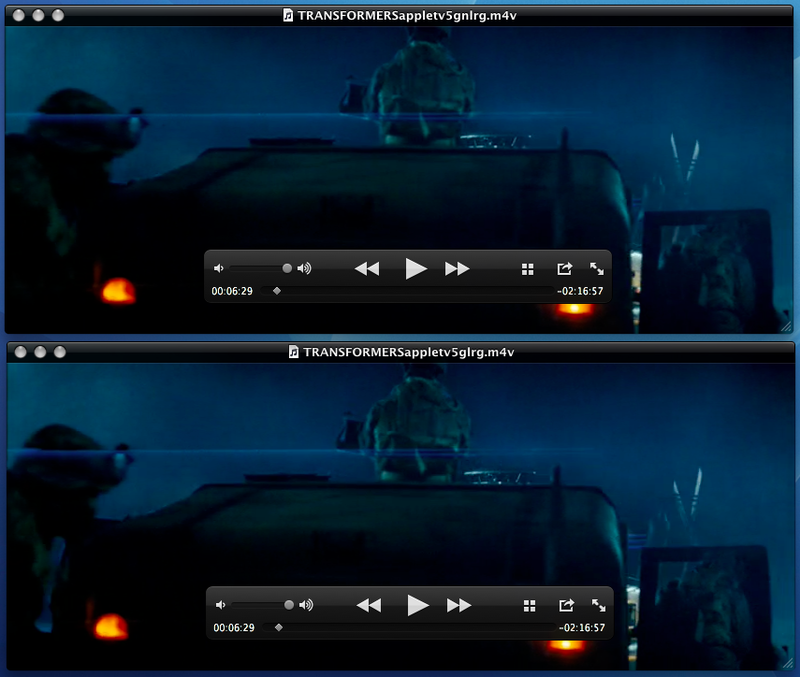 I ripped the first Transformers movie with the Apple TV preset into two files. On one I left “large file size” checked, on the other I removed that. I added “iPod 5G Support”. There was no discernable difference, either in file size or quality. Both files were exactly the same size. I have no idea what “Large File Size” does. Both files were significantly smaller than my universal settings, using that yielded a file at 3.38 GB. Oddly, this larger file will play on all iOS devices, while the one I ripped yesterday will only play on “HD” capable ones. This is primarily to do with the percentage of constant quality I select in the universal files. I found I liked the higher percentage of 65%, more than the preset 60%. Anything over 65% ends up with a huge files. But as you can see, the 60% mark produces much smaller files. I took a couple of screen captures of these last two rips. The compression artifacts that you see are in every version I have ripped with every setting. The combination of dark with smoke does not compress well. 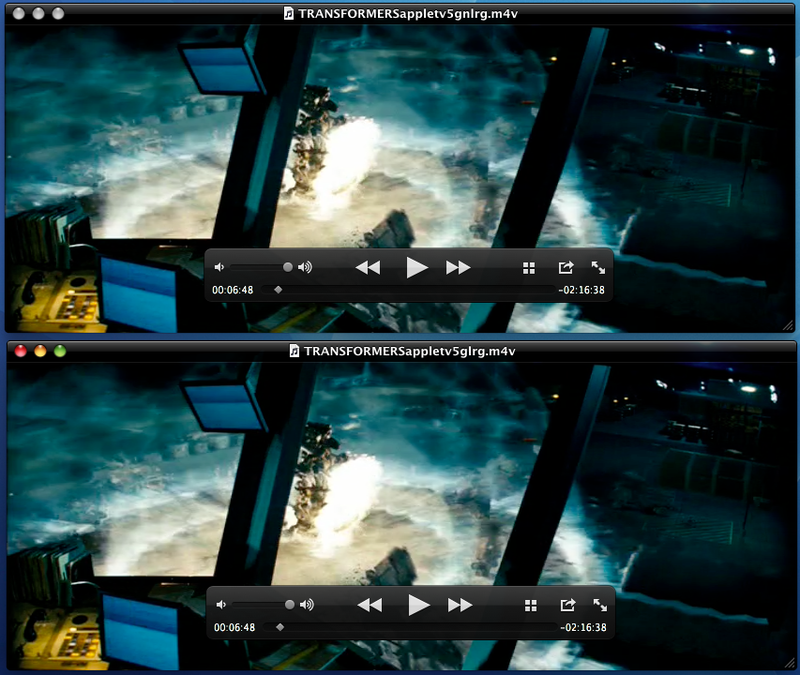 But, you can also see that either version delivers the same compression artifacts. Both load onto an iPad and my iPhone 3GS. I assume they will load onto the new iPod Touch. They will not load onto older iPods or older iPhones. I was very pleased with it’s performance on the iPad. The image looked great. Now that the iPods/iPhones have the ability to play higher quality video files, I may switch to the Apple TV preset all the time. I know I won’t be able to watch them on my wife’s 4th Gen Nano, but with an iPod, iPad, an iPhone 3GS and an Apple TV that can play them, I don’t think I will miss it. My goal has been great looking video, with decent file sizes. The Apple TV preset, adding the “iPod 5G support” gives me both on all of the “HD” capable iOS devices, as well as the Apple TV. So, after my pre-announcement post, I never came back and commented on the actual announcment. First, the ability to stream was very nice. I suspect their main purpose was to tie in the Apple TV as a Stream-Only device. Let me say that the stream quality was amazing. I watched full screen on a 30″ Apple display, and could not believe the detail. There were a couple of hiccups, and my bandwidth had some issues, but overall it was very good. Well I was surprised by what was announced. I really thought that Apple TV would be an iOS device. I can understand why they are not doing that yet, but I wish they had. What they did announce isn’t really complete. It’s a start. I do not think the $1 TV rentals are a good idea. I won’t be renting them. If they could offer network subscriptions or something, I would think about it. But the streaming model is solid. It’s a good start. Adding Netflix is great. Now they need Hulu Plus. I’d love for Apple to create their own streaming “channel”. So, it’s not complete, but its a start. I miss the local storage a bit, but will not miss the time it took to sync. And for $100, I pre ordered it. I’ve already got the entertainment center set up, with an HDMI cable waiting. I think they made the right move on the Shuffle. The Nano is probably the right thing as well, although I hate to see the video capture and playback go away. Moving to HD only capture devices is smart, but a little sad. Still, I don’t know many that used the other versions of the Nano to watch video. I’ve tried it, and didn’t go back. The new Touch was what I am most excited about. The only disappointment for me was that you don’t get the 5 megapixel camera for stills. But the HD video capture and retina display is much appreciated. Faster processor and the 3 axis Gyro will make this even more of a gaming device. I went ahead and sold my old Apple TV and iPod Touch to fund the purchase of this new one. I like Game Center. I pay Microsoft $60 annually to get what Apple is doing for free. It’s a lot like Ping, in that it is a framework that hasn’t filled out yet, but the potential is there. We just need more games that take full advantage of it. We don’t need more games that simply let you share scores. We want internet multiplayer. Cro Mag Rally has this, and it’s fun. This will only get better.